For HR professionals, HR technologists and HRMS and related systems vendors, the “buzz” about AI (artificial intelligence) is recognized for what it is – an impactful, latest use of advanced technology that will continue to influence, and has already impacted the way work gets accomplished in many industry verticals. For example, much has been written about the incredible results of using AI in Healthcare. Articles and essay from medical professionals rave about the use of, speed of, machine learning within AI to identify early signs or abnormalities, by examining thousands of data points (medical histories, genetic markers, blood chemistry, images etc.) that can result in an accurate early diagnosis. That alone can and has, and will continue to save lives. We all get that AI will continue to evolve, and with it society benefits in many already proven amazing ways. However, for the HR professionals AI can be a two edged sword. It can result in extremely effective and efficient executions of work tasks – and at the same time – be something that threatens the existence of many of the functions, responsibilities and work outcomes currently within the realm of HR’s oversight. So, without focusing on that particular concern, lets consider this slightly different take on the term AI – a kind of step back and having a more current and achievable task based mindset perhaps. ‘’AI “ can also mean “ACTIONABLE INSIGHTS”. Consider this question; what is the most important role of today’s HR Professionals? Arguably, a most reasonable response would be to help frame any organization’s strategies in attracting, engaging and thus retaining an effective high performing workforce. HR people are aware of the many published posts, magazine articles, white papers etc. covering the workplace and workforce about the latest trends and facts regarding the overall impact and benefits of Artificial Intelligence in all manners and forms on society and on work output. In many instances, some experts surmise that some jobs – including aspects of HR functions might certainly lessen, if not disappear completely. In functions outside of HR this proposition does have credence in the more operational activities where a combination of ROBOTICS and AI will indeed replace job functions that do not require human emotions such as empathy, logic, reasoning etc. To alter the perception that AI might lead to HR’s obsolescence, or at least threaten the classical roles within HR’s realm and lessen the now prevailing concept that indeed HR deserves the preverbal “seat at the table” – HR executives must leverage what is now being provided by top tier HRMS solutions (seizing on the momentum- and publicity, and even fear of “not having” – by offering “AI – like” out of the box / “as delivered” functionality and reporting), usually called “workforce analytics”. Taking advantage of a well thought out and executed delivered functionality HR executives can step back from the traditional definition of AI – (if one exists – but that is another matter) and instead use the power of HRMS to generate supportive output underlying the presentation of a different kind of AI – that of an “Actionable Insight”. This particular view of AI can more easily be accomplished – as the better HRT vendors already are utilizing models, forecasting tools, regression analysis and algorithms to generate meaningful information. Information that is derived from the “data” points maintained in their underlying and foundation data base. Another catch phrase here, and one more easily to comprehend and even to sell internally to (internal) skeptics – is the commitment for HR to move FROM – “DATA MANAGEMENT “ TO “INFORMATION CRAFTSMANSHIP”. The goal is to provide to senior executives something to think about. Data altered into “information” that is itself provides actionable insights – ie. ‘AI” of a simpler and more meaningful kind – that of valuable insights in support of over arching strategies leading to programs and specific actions. I suggest a renewed interest in providing a series of KPIs – not specifically stand alone metrics. KPI differ from metrics in that KPI show effectiveness and align directly to organizations’ strategies. 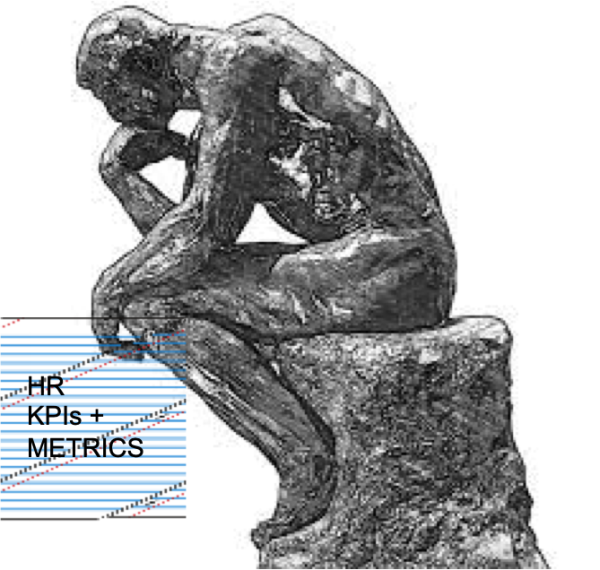 Metrics, while important, do not necessarily show effectiveness, but they remain an easily accomplished first step towards illustrating the power of insights – provided by the HR function itself. Here is a list of important and strategically based KPI’s (thanks to Erik van Vulpen, in his LinkedIn post of March 2019 (extracted and summarized). All of which can support a variety of Actionable Insights– when produced and internally marketed successfully by HR executives. Absence rate: calculated by dividing the number of working days in which the employee was absent by their total number of working days. Absence cost: calculated by including employee pay, the cost of managing absenteeism and appropriate replacement costs. Benefits satisfaction: measured through an employee engagement survey. Employee productivity rate: measured in various ways – components tie employee type, production output with revenue numbers. Employee satisfaction index: measured through employee attitude and engagement surveys. Employee engagement index: measured also through attitude or engagement surveys tied to various turnover levels. Employee innovation index: measured through attitude or engagement surveys and can be tied (if appropriate) to number of patent applications perhaps – or other indicators of creativity. Internal promotion rate: measured by dividing the number of senior functions that were filled through internal promotion by the total number of senior positions filled. Percentage of cost of the workforce: measured by the “cost of the workforce” (salaries and benefits) divided by the total cost of overhead. Quality of hire: the percentage of new hires that are given a “good” rating by their manager within their first year. Turnover rates: Voluntary vs. Involuntary vs. Unwanted (when good performers leave). All as a percentage of total turnover. 90-day quit rate: Sometimes also the 360-day quit rate. This is the number of hires that leave within 3 months or a year. Note: The details of this listing and other related work regarding Workforce Analytics can easily be found on Erik’s LinkedIn page. A most effective way of providing AI – “Actionable Insights” would be to take whichever KPI and /or metric is most meaningful within your organization and present it as a graphic and show its movement over time. The well known effectiveness of an HRMS “one system of record” easily makes that output happen. HRMS have done so for decades with various ad-hoc and provided “library of standard reports. More recently adding industrial and organizational psychological underpinnings in some of the provide output – such as the classic “nine box model” – 3 levels of Performance vs. Potential – with the addition of the identification of specific employees who might be a flight risk – even if they themselves are not actively looking to leave their position! This would be an effective and engaging ouput – displaying an insightful view of the current workforce which must lead to programs and actions within a documented Talent Management Strategy. Hint: start with “turnover” metrics, then progress to the identification of “key employees”, then map the attributes that “key employees” have including performance levels, position in salary grade and add the work teams they have contributed to. That should eventually determine a value proposition for any one employee. Then it is feasible to see if they are a “flight risk” attractive to competitors (perhaps) in whatever the economy and market is calling for in your geographic region. In recent years many new vendor offerings – in combination with the base HRMS master file – help to manage the movement of, careers of the extended workforce for a company. A new thrust of CRM – Candidate Relationship Management and Career Management software – utilizing Social Media, “gamification” mentor/mentoree matching, etc. – are making this type of functionality attractive to the new generation in the workforce and will continue to increase employee engagement. After all – it all stems from date sensitive data points. Once historical data is translated into a forward looking model – HR and HR technologists can generate a dashboard of KPIs and metrics – providing “insights”upon which “actions” and strategies can be based. These actions must surely benefit and support the key strategies of the corporation. Output focusing on staffing, talent and – all aspects of workforce composition, and movement – is indeed the undisputable goal of an organization: keeping the identified (or hidden) best employees. After all – your workforce and its culture is one thing that any competitor cannot quickly duplicate! This is something to strive for with this alternative concept of “AI’. It might even lessen your anxiety about your future viability. Providing “Actionable Insights” will ensure that you and your HR functions will remain valued and necessary. And at the same time – it furthers the reputation of the HR function – adding “Clout”and influence to both the HR function and to your personal skill set and reputation. It is well worth thinking about.